Screenshot from GMA-News report (watch below). Philippine police investigators have uncovered a syndicate illegally selling babies via Facebook for as little as 10,000 pesos. According to a report on GMA-News on Monday (February 11), National Bureau of Investigation (NBI) operatives rescued a one-week old baby that was about to be sold by a couple in Las Piñas. Ronald Aguto, the NBI’s cybercrime division chief, said the Facebook page being used as a platform to sell babies was very active. “[The operator] noted in his account that they were very grateful, and this proved that they were doing this transaction. They were also very grateful to them [the couple] because they had a son to sell,” he said. The rescued baby was offered for 40,000 pesos but, according to Aguto, babies can be bought for as little as 10,000 pesos. 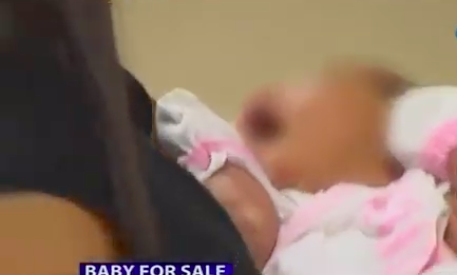 The mother of the baby told reporters that she decided to sell the baby as soon as she realised she was pregnant. The father also admitted the plan, pleading poverty. As well as the parents of the baby, two other suspects were also arrested during the operation. Social welfare officer Christine Baronia said that the baby would be turned over to a residential facility until some relatives could be found to take care of the baby. Aguto also said they would investigate the parents to ensure the baby was really theirs. “The parents seem so unrepentant, it makes us wonder if they really are the real parents of the child,” he added. The suspects will face charges for violation of the expanded human trafficking law and adoption act, the report said. Last September, we reported how two women — one a registered nurse — were arrested at Manila airport for trying to sell a baby for 30,000 pesos. The NBI said the two suspects first contacted each other through the Facebook page Babies Home.ph. It is not known if the same page was involved in this week’s attempt at selling babies.